OneJustice volunteers travel hours by bus to meet the legal needs of rural senior citizens. Today on National Grandparents Day I count myself lucky to be able to celebrate my amazing grandmother, who – at 101 years old – has seen tremendous changes in our society and world. I also count myself lucky to live close enough to be able to spend time with her – as do my teenaged daughters. The origins of National Grandparents Day started in 1970 with Marian McQuade, a housewife in West Virginia. She hoped to persuade grandchildren to tap the wisdom and heritage their grandparents could provide. She also championed the cause of the lonely elderly living in nursing homes. After years of advocacy, in 1978 a congressional resolution declaring National Grandparents Day as the first Sunday after Labor Day was signed into law by President Jimmy Carter. Today, while I honor the many ways that my grandmother has influenced my life, I will also be thinking about the many older Californians who have not been as fortunate. Over 390,000 Californians over the age of 65 live below the federal poverty level. Many of these seniors face a barrage of legal issues relating to access to health care, economic assistance benefits, housing, and food. They also have legal needs relating to consumer debt issues, advanced planning and wills, residential and nursing home care, and caregivers issues – whether they are raising grandchildren or caring for an aging partner or spouse. In fact, more than 116,000 people over 60 in California have primary responsibility for the care of their minor grandchildren. So on grandparents day, these older Californians are actually still handling the day-to-day responsibilities of parenting. 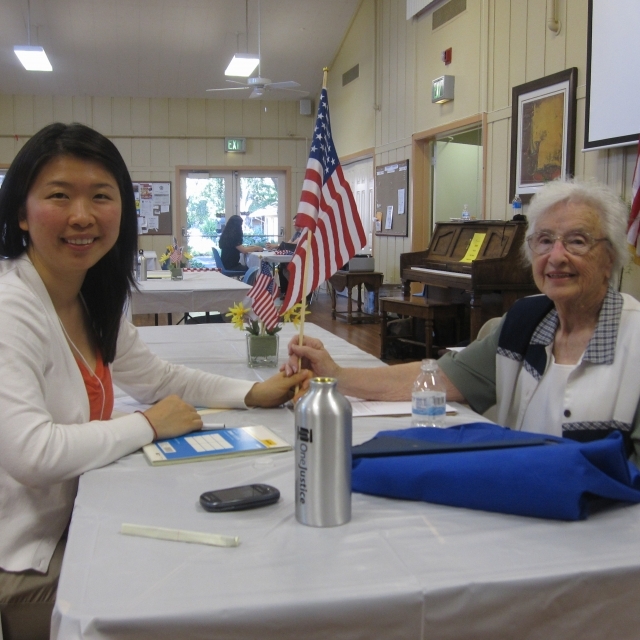 Justice Bus Trips bring volunteers to help seniors living in rural areas. 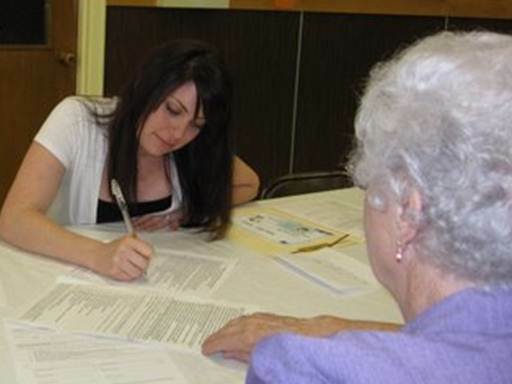 A 2011 study by the Legal Aid Association of California (LAAC) found that county agencies serving seniors reported that the most serious challenges to the safety and well-being of seniors are primarily legal issues, including: elder abuse (including consumer fraud targeting seniors), housing issues (including discrimination, home repair, affordable housing), and bankruptcy/debt. Elders who are LGBTQ, have limited English proficiency (LEP), or are low-income are particularly vulnerable and in need of legal assistance. Sadly, the LAAC study also reported that older Californians frequently are not aware that free legal help may be available to them and may wait to consult an attorney until their situation has become a crisis. OneJustice supports a statewide network of nonprofit legal organizations that provide critically important legal help to more than 35,000 low-income and vulnerable seniors each year. Older Californians living in rural areas face unique barriers to accessing the legal help they need. “Growing old has never been easy. The difficulties are especially pronounced in rural America because, census data shows, the country’s most rapidly aging places are not the ones that people flock to in retirement, but rather the withering, remote places many of them flee. The elderly who remain — increasingly isolated and stranded — face an existence that is distinctively harder by virtue, or curse, of geography than life in cities and suburbs.” (The New York Times, For Elderly in Rural Areas, Times are distinctly Harder, December 10, 2009.) Despite the significant need, rural seniors have unique difficulties in finding help due to a lack of access to transportation, computer or internet access, language barriers, and geographic isolation. In addition, due to limited resources, the few legal services organizations that exist to serve rural parts of the state are responsible for large geographic regions without sufficient staff. Check out our Pinterest page for boards with resources on topics like guardianships, elder abuse, and simple estate planning. This is why so many of our Justice Bus trips focus on meeting the legal needs of older Californians living in rural and isolated areas. 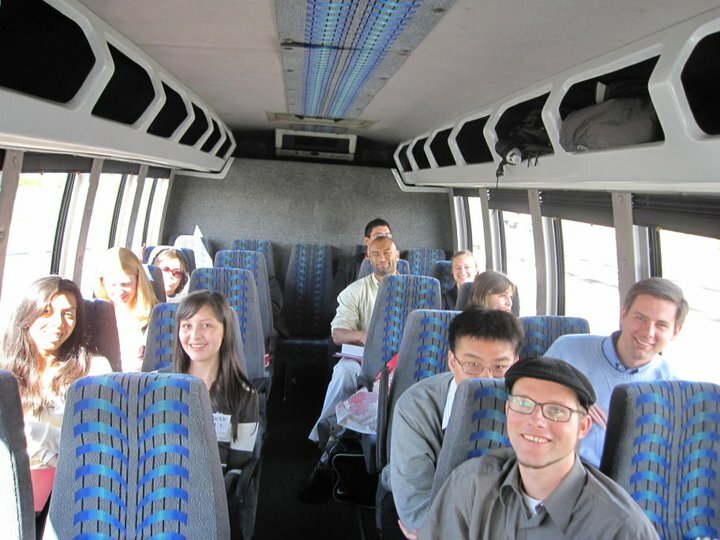 Our volunteer attorneys and law students travel hours by bus to set up traveling free legal clinics at senior centers, near medical clinics, in libraries and churches, and at senior assisted living facilities. 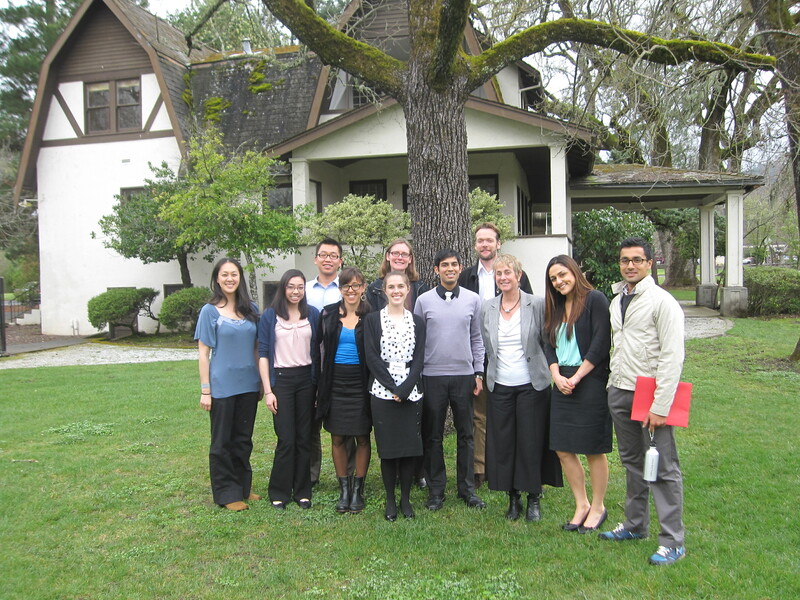 These volunteers work with local nonprofits in our network to bring life-saving legal help directly to seniors in need. In isolated areas of counties like Napa, Tulare, and Mariposa, these Justice Bus clinics are often the only way older residents will have any access to legal assistance. This is also why we created the website LawHelpCalifornia.org and our Pinterest page to post free downloadable resources on legal topics like guardianship, advanced health care directives and simple wills, and elder abuse. The official flower of Grandparents Day is forget-me-not. On this day when we celebrate the heritage and wisdom of our grandparents, let us also remember the hundreds of thousands of older Californians who are alone today – alone facing pressing legal problems relating to basic life necessities. By continuing to work together, we can build the resources needed to help them solve their legal problems. What is YOUR favorite memory of time spent with a grandparent, or the most rewarding experience you have had helping a senior citizen? To all who labor to provide legal services to the poor – thank you! Labor Day was created to recognize Americans workers and their many contributions to the strength, prosperity, and well-being of our country. It is particularly poignant in this economy, as hundreds of thousands of Americans seek work, and the jobless rate continues to climb. In addition, the majority (63.4%) of low-income Californians are working and still cannot pull their families above the poverty line. In 38.3% of poor families, a family member is working full-time, and in another 25.1% someone is working part-time. Workforce participation among the poor is higher in California than in the rest of the nation. On this day when our country celebrates the American labor movement and a wide variety of workers, here at OneJustice we honor the work of a particular sector – the staff and volunteers at the almost 100 legal nonprofit organizations in California that seek to bring a little more justice into the world. OneJustice supports a network of just under 100 nonprofit legal organizations which employ around 1,700 workers and under 800 attorneys. This network takes on the Herculean task of trying to meet the legal needs of the over 8 million low-income Californians facing legal barriers to basic life necessities. Clean water. Food. Health care. Employment. Education. The simple math adds up to 10,000 eligible clients facing pressing legal issues for every staff attorney. Clearly, the task is too big to be taken on alone. That is why OneJustice also celebrates the hard work and compassion of the hundreds of volunteer attorneys who – in addition to their busy practices in the private sector – volunteer with these nonprofits to help expand the legal services for the poor. 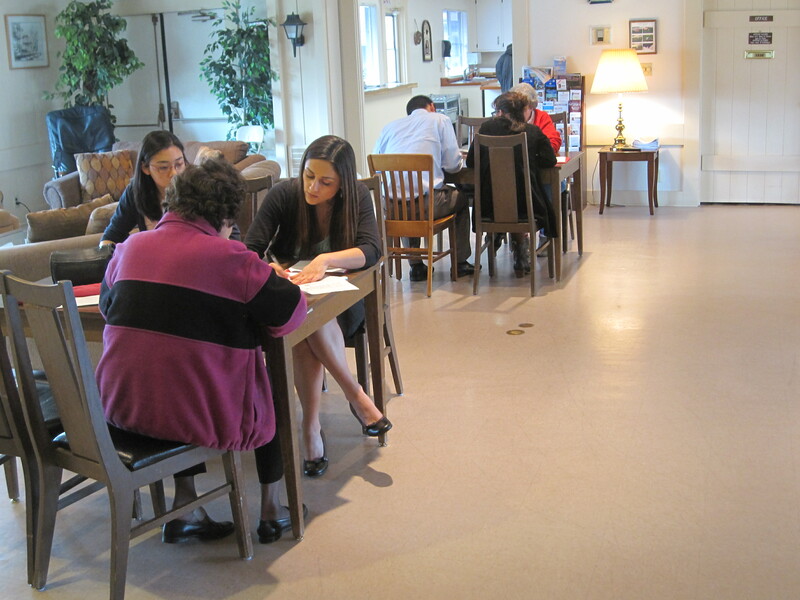 These dedicated volunteers show up at night and on the weekends – they staff free legal clinics and represent low-income individuals in court – they make grandparents into legal guardians, combat identify theft, make sure seniors get their medicines, and empower survivors of domestic violence to move forward. Sometimes they even board buses and travel for hours to provide free legal help to those in isolated and rural areas. So – to everyone who strains to bring justice into the world, who does what has to be done to expand legal help for the poor, who labors to make the world just a little fairer – we thank you! Now that you know who OneJustice celebrated today – who do YOU honor on Labor Day? March is Women’s History Month – when we celebrate the contributions of women to events in history and contemporary society. So at OneJustice we’ve been pondering the intersection of women – both clients and attorneys who are women – and the system that provides legal help to low-income and other underserved Californians. Each year, the almost 100 legal nonprofit organizations in California provide legal assistance to approximately 270,000 individuals, families, children, and seniors facing pressing legal problems relating to basic human needs. Hunger. Safety. Housing. These services are focused on those living at or below 125% of the federal poverty level (for example, the limit for a family of three is an annual income of $23,862 or less). Poverty in California is higher among women (at 16%), than among men (at 14%), and highest among children, as a staggering 21% of California’s children live in poverty. Nationally, the most recent census data showed more than 16.4 million women living in poverty in 2009, the largest number since the Census began collecting this data in 1966. A study of prevalence of hunger among California women found that 22 percent do not have secure access to food. In that larger context of women and poverty, California’s nonprofit legal organizations provided services to over 151,000 low-income women in 2010 (compared to just over 106,000 men). 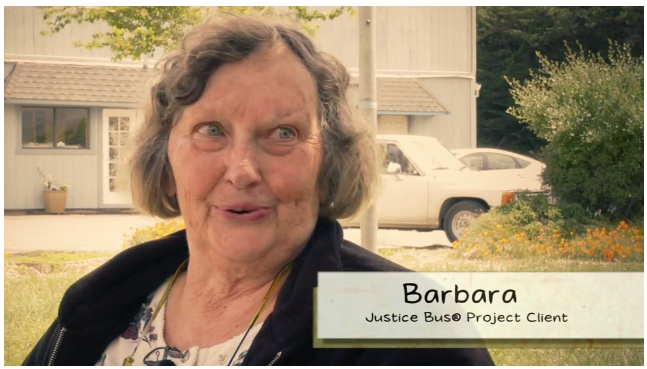 These are women like Barbara, shown above, who came to a Justice Bus legal clinic in her small, isolated coastal town. Women who are grandmothers needing legal guardianship of their grandchildren. Mothers fighting for medical services for their children with significant health needs. Teenagers experiencing dating violence. These are women who are seeking help in the face of overwhelming factors that tell them to give up. It is shameful that our legal services delivery system is so underfunded that we can only provide this life-changing assistance to one-third of those in need. At the same time, the attorneys working at these legal nonprofit organizations are increasingly women. A 2010 report by the Legal Aid Association of California (LAAC) on Retention & Recruitment in legal services nonprofits found that two-thirds (67 percent) of the legal services attorneys are female; in contrast, during that same time period, only 34% of California State Bar Members were women. In 1878, Clara Shortridge Foltz began her struggle to become California’s first woman lawyer, and now, 134 years later, approximately 50% of law school graduates are women. The women working at nonprofit legal organizations graduate from law school with overwhelming debt burden, and nevertheless carve a career path in the nonprofit sector, using their legal skills and expertise to help clients who are women seeking to eliminate barriers to justice in their own lives. Those woman client/woman attorney partnerships are pretty powerful – and they are part of what we should be celebrating this month.